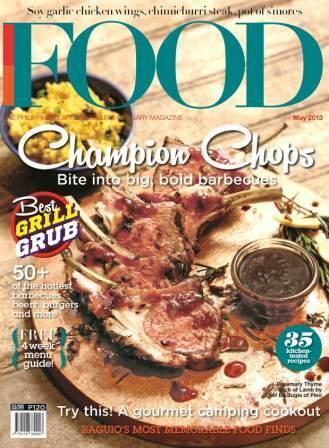 FOOD Magazine Serves a 'Grilling Issue' This Month! Enjoy the summer heat with the best barbecues! This May, bite into grilled perfection with delectable dishes created by Chef Ed Bugia of Pino. With this issue’s “Best Grill Grub”, a special feature on top picks for steaks, ribs, beers, burritos, burgers, wings, and other awesome food finds and places, readers get a more ideas for how to satisfy their taste buds on road trips, family nights, game nights, or even date nights. With this issue’s monthly food tour, both old favorites and new exciting places in the summer capital of Baguio are revisited and rediscovered. Aside from that, the entertaining feature on camping gone gourmet is definitely one not to be missed. With the best of summer still yet to come, there’s more to try in Home Basics—as delicious marinades, chicken wings and lots more are sure to titillate the palette.